Brother Osric's Scriptorium | A webcolumn by Michael Spence, wherein science fiction and fantasy meet "the queen of the sciences"
people of similar skin tone simply sought each other out during the global diaspora. physically, the one immediately discernible distinction between “white” people and “black” people is not that “black” people lack something. It’s the “whites” who are deficient. Certainly in that respect, “white supremacy” has it all bass-ackward. So does anything that hints that lighter-skinned “black” people are to be preferred over darker-skinned. As a pink person, I am deficient in something that my darker-skinned brothers and sisters possess more richly. And they are closer to the original design of humanity than I am. All those paintings of scenes in and around the Garden of Eden need to be drastically revised in the interest of accuracy. Our first parents should be depicted not in tones of ivory or cream, but of the deepest ebony and obsidian. 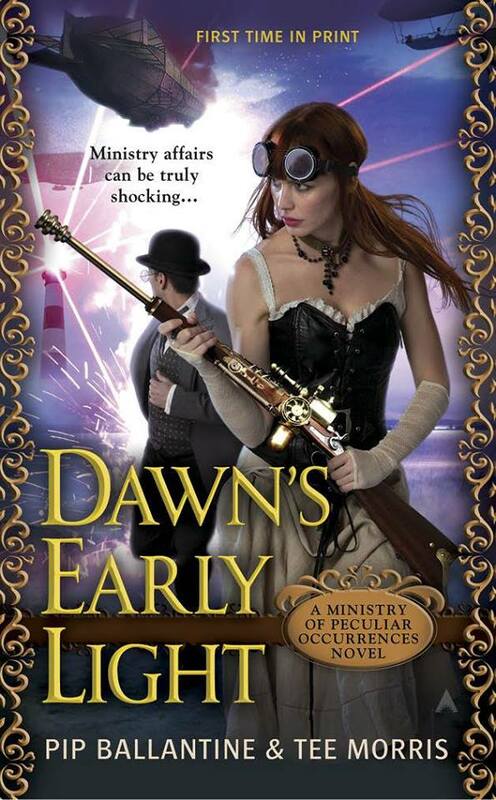 Dawn’s Early Light: A Ministry of Peculiar Occurrences Novel . By Pip Ballantine and Tee Morris. New York: Ace Books, 2014. Napoleon Solo and Illya Kuryakin . . .
Kelly Robinson and Alexander Scott . . .
John Steed and Emma Peel . . .
Scarecrow and Mrs. King . . .
Annie Walker and Auggie Anderson . . . Agents Ward and Skye . . .
. . . Wellington Thornhill Books and Eliza D. Braun. The annals of popular espionage fiction — especially the sort that’s written and read in a spirit of fun — resound with tales of teammates who became friends, and, in more recent pairings, considerably more than friends. (Spouses Pip Ballantine and Tee Morris could be added to the latter group, but I doubt their story bears any similarity whatever to those in the above list.) In the case of Agents Books and Braun of HRM Queen Victoria’s Ministry of Peculiar Occurrences, romantic tension can be frustrating, especially when it interferes with getting the job done. And when the job involves airships mysteriously disappearing off the coast of North Carolina, you really don’t want distractions. Books and Braun illustrate two time-honored principles. The first one — “Opposites Attract” — is widely repeated. The second — “Opposites Have a Devil of a Time Communicating” — is widely swept under the rug but refuses to stay hidden. It’s tragic in a drama, but in a comedy it makes for considerable will-they-or-won’t-they fun. And make no mistake: Dawn’s Early Light is fun. You see, toward the end of their previous book-length adventure, The Janus Affair , Wellington Books planted a solid one on Eliza Braun in the Ministry’s Archives, and Eliza is still trying to deal with it. She remembers him saying he considered her safety more important than that of the Ministry itself . . . but since then, nothing. He’s been the perfect gentleman, but that’s about it. Nor are things any more encouraging on the other side. Now that the Ministry has assigned Books and Braun to assist colleagues in the United States (partly as a way of getting them out of the English spotlight; while they did solve their last case, it was most definitely not by the book), Books discovers that agent “Wild Bill” Wheatley of America’s OSM (Office of the Supernatural and Metaphysical) is tall, handsome, rugged, and likes to play with guns. In other words, he’s just the kind of guy Eliza Braun would go for. And that’s exactly what she seems to be doing. Meanwhile, the four of them — the fourth being the beautiful Felicia Lovelace, who promptly sets her cap for Wellington Books — must find out why dirigibles are vanishing, crew and all, off the Outer Banks. Is a supernatural manifestation to blame? If so, then why would Thomas Edison show up in the middle of it all — in circumstances that make him look like the villain of the piece? And what connection does it have to Ministry consultant Nikola Tesla and perennial Ministry nemesis the House of Usher? As you can guess from the cover’s tagline, “Ministry affairs can be truly shocking,” electricity is involved. We are still firmly within the “steampunk” genre, but here the hiss of steam is in energetic dialogue with the zap of electrical current. Like its two predecessor novels, Phoenix Rising and The Janus Affair , Dawn’s Early Light revels in steam-powered technology, operating non-stop. Much of it is provided by Agent Books, who is no slouch with a screwdriver and who maintains a marginally respectful relationship (in point of fact, he’s less than impressed) with the Ministry’s Research and Design department. That department, the Ministry’s equivalent of Q Branch, provides some nifty weaponry; but it’s Books who shows us that Babbage’s Analytical Engine can be engineered into a laptop. Of course, no secret agent’s adventures would be complete without an impressive automobile, and Books not only designs and builds but brings to America a motorcar that … well, let’s just say that Ian Fleming would be delighted. Where Books specializes in knowledge (he is Chief Archivist of the Ministry, after all) and technology, Eliza Braun specializes in smiting men (via flirt or fist) and making things go boom. All their talents get quite a workout as they go from the East Coast to the Wild West to the even wilder West Coast, investigating skullduggery and pursued by skullduggers aplenty. The action does not let up for a moment — authors Ballantine and Morris maintain a pace that alternates between physical and emotional tension, keeping the story moving and the reader anticipating. And there’s a lot to anticipate, because disappearing dirigibles are only the beginning of the villainous plot. The Electric Age is coming to America, and its chief architect does not mean us well. As for sparks between our two Ministry agents … I’ve learned not to try outguessing Pip Ballantine and Tee Morris. Peculiar Occurrences can crop up at any time, you know. Clerk’s postscript: If it sounds as though this writer has had some experience with the Ministry of Peculiar Occurrences, it’s true. 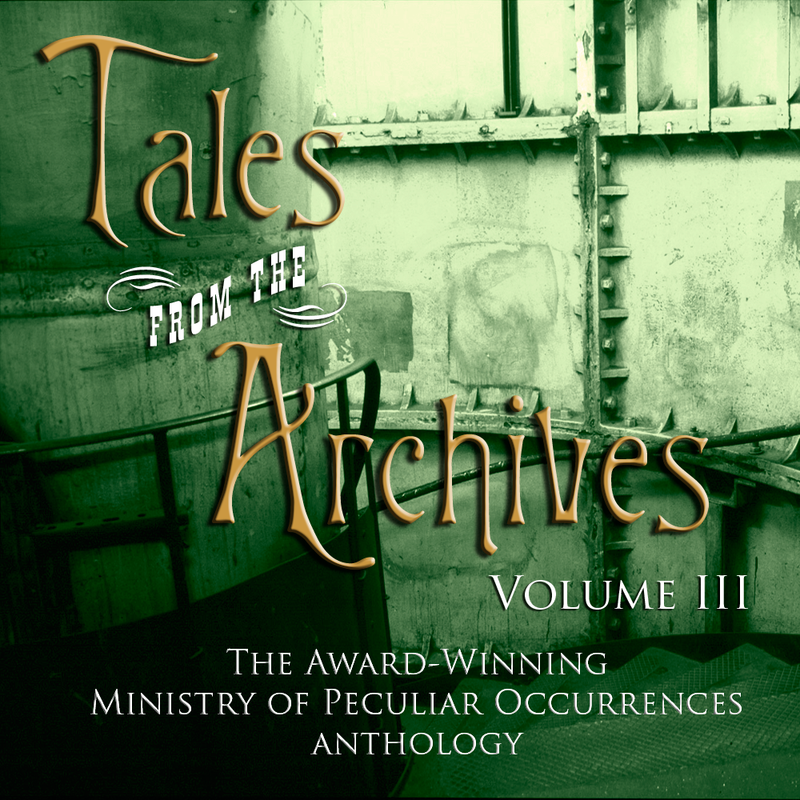 Along with their books of the Ministry, Pip and Tee also present short stories in their series Tales from the Archives, which appears both in print and as a Parsec Award–winning podcast. 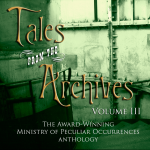 Volume III of the Tales contains my story “And Why the Sea Is Boiling Hot,” addressing the remarkable invention of the æthergates, which play a part in various Ministry accounts. For specifics, please see www.ministryofpeculiaroccurrences.com. The wondrous WEATHER CHILD will soon be born! Awhile back, in a discussion about magic, I referred to Philippa Ballantine’s marvelous New Zealand novel Weather Child , in which magic is done by a team of a human and a symbiont called a seraphim who dwells within the human on the cellular level.1 Weather Child was well received in its initial, podcast form, and many eagerly awaited its print publication. That blessed event is finally coming to pass. Imagine That! Studios will publish Weather Child on 1 March — and today, on Waitangi Day, the 174th anniversary of New Zealand’s founding, Ms. Ballantine has released the book’s cover to Internet viewers. Designed and executed by Alex White of The Gearheart, this thing of beauty may be seen over at www.pjballantine.com. Incidentally, Ms. Ballantine met with a puzzling reception from major publishers who said that Americans didn’t want to read stories set in New Zealand. I suspect that may have been their marketing voice (which, let’s face it, is often clue-impaired) rather than their editorial voice — I can just hear Jay Leno saying, “Oh, right, because if there’s one thing American SFF readers just can’t stand, it’s stories that let you discover new, unfamiliar worlds!” One can hope that Peter Jackson’s Tolkien films, not to mention TV predecessors Hercules: The Legendary Journeys and Xena: Warrior Princess , have managed to kill that attitude dead, dead, dead. I intend to be standing in line when Weather Child arrives. I think you’ll want to be, too. To answer those of you who observed that 2012 has been absent from these [pages], we offer the following explanation: Many things actually did happen during 2012, including the move of MARS Creative Projects’s home offices across the Mississippi River, that firm’s expansion into audiobooks, its entry for the Escape Pod SF podcast, and its collaboration with the MZB Backlist Project. (Information on the second and fourth items is forthcoming.) With such important activities in progress, we clearly dared not risk falling prey to the Mayan cataclysm (or was it merely a timing-out?) predicted for 21 December 2012. We therefore accepted the offer of the Temporal Services Administration (TSA) to shunt the firm directly from the end of November 2012 to January 2013, for the (to us) quite reasonable fee of January–November 2012. All is well, and we are completing our systems reconfiguration. To those of you who missed us, welcome back, and we hope to provide you with further information soon. And to those of you who also took advantage of the TSA shunt service, Merry Christmas! By which I mean Lisa Waters’ and my story “Truth in the Inward Parts”1 in Marion Zimmer Bradley’s Sword and Sorceress XXVI , just released by Norilana Books and available in print and for Kindle. It’s the latest story in our “Treasures” series, and from Tuesday 27 Dec through Thursday 29 Dec you can get the Kindle edition of the story itself for free. The “Treasures” stories take place in a fictional England-analogue, mostly at the College of Wizardry at the University of Albion. This story takes place in town, however–specifically, at the dentist’s office. The dentist has been murdered, and the Guardian of a Treasure has found his body–but they’re in a locked room of which no one knows the location. The Treasure–a magical artifact that can open any lock–doesn’t work on this one. And the Guardian is running out of air. So celebrate the last night of Hanukkah and days 3-5 of Christmas with us. After all, U.S. Customs and the TSA might delay the French hens, your neighbors might not appreciate Calling Birds (angry or not), and at more than $1,600.00 per ounce who can afford five gold rings? Enjoy our free e-book instead–and check out others in the “Treasures” series! Since the time of Rimon Farris, atrocities have been committed upon us to keep us from attaining our goals. To the roll of martyrs, the name of Feleho, who of his own free will became Ambrov to Zeor, is added. Let not his death break our spirit. Let us lift his burden and carry it on so that his death will be imperceptible to his enemies. These words shed an instructive light on our rememberence of events ten years past. Many times have I heard someone say, “If we do such-and-such, the terrorists win.” What I have not heard acknowledged, however, is that in fact the terrorists did succeed. They destablized our government operations and our own everyday lives. They created an undercurrent of distrust. They transformed air travel, which hitherto had been merely uncomfortable and annoying, into a fiesta of frustration, paranoia, and occasionally outright foolishness. In short, they infected us with terror. A far better response would deny them their success. They want us terrified? Let us not fear. They want us destablized? Let us affirm our confidence. Let us respond with sadness, with grief, with determination — but not with fear of the unknown future. Since the time of the Founding Fathers, atrocities have been committed upon us to keep us from attaining our goals. To the roll of martyrs, let the names be appended of those who perished in the Twin Towers, in the Pentagon, and on board United Airlines flight 93. Let their deaths not break our spirit. Let us lift their burdens and carry them on so that their deaths will be imperceptible to our enemies. That is the way to win. If religion were true, its followers would not try to bludgeon their young into an artificial conformity; but would merely insist on their unbending quest for truth, irrespective of artificial backgrounds or practical consequences. With such an honest and inflexible openness to evidence, they could not fail to receive any real truth which might be manifesting itself around them. The fact that religionists do not follow this honourable course, but cheat at their game by invoking juvenile quasi-hypnosis, is enough to destroy their pretensions in my eyes even if their absurdity were not manifest in every other direction. I’d agree, with one emendation: Because of our fallen nature and because we have so much to unlearn from our culture (sorry, nobody comes into this world a tabula rasa, and failure — or refusal — to receive truth is widespread; see Rom. 1:19–20), we need to learn how to search for truth and test what is found. But once the toolbox is supplied … go for it!